YOUR CAMERA IS FAIRLY CRAMMED with features and functions that may or may not help you make better pictures. Certainly, all are intended as conveniences or shortcuts, but, since no one will ever utilize 100% of their gear’s potential gimmicks, you alone must decide which menus and goodies will actually help you exercise the most control over your results, and which are merely distractions. Your own path as a photographer will decide the real value of your camera’s various add-ons. One automatic setting that I personally toyed with for a time but now almost exclusively avoid is the so-called “burst” setting, which allows you to automatically snap a ton of images very quickly by merely depressing and holding the shutter button. Its appeal is chiefly in helping to track fast-moving activities, like sports, children, or any other rapidly changing situation that presents challenge in setting or formulating shots on the fly. The camera is basically taking pictures faster than you suppose that you could plan them yourself, the idea being that, upon review, something in that batch must be usable, with the also-rans just being deleted later. 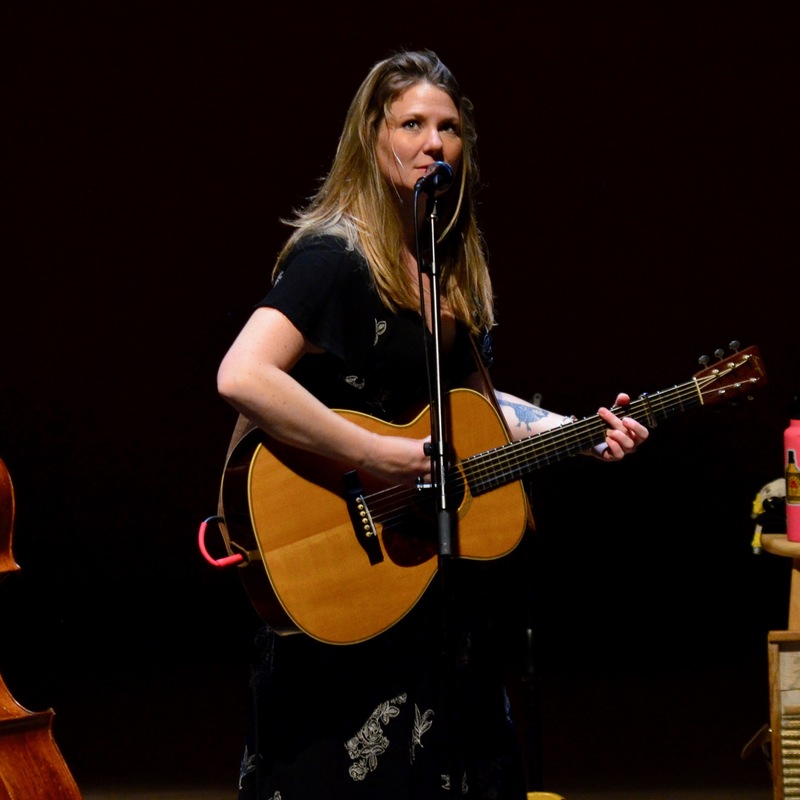 Celia Woodsmith of the bluegrass band Della Mae, April 10, 2019. But I really find this mode a detriment, not a bonus, simply because the entire picture-taking process has been handed over to the camera. The shooter is completely passive, a bystander to a machine that is now making all the decisions. It’s like spraying a fusillade of bullets over a wide arc in the hope that you’ll hit something…anything, and it’s about as far from purposeful picture-making as you can get. I realize that the fear of missing something great can be tempting, but taking a whole bunch of pictures real fast, none of which could be anything other than a technically acceptable accident, is not a creative decision. How can it be? Listen, I get it. Things happen fast, and it takes a great deal of practice in shooting in changing conditions. But the idea that there’s no time to frame or conceive an image just because it’s in motion is a false one. Will some opportunities be missed if you have to compose and click in the moment? Sure. Will some choices be unproductive? Yes. But the results will be your results. The image you see above was taken in a concert environment, which is just as volatile as any kid’s baseball game or birthday party. Faces, physical blocking, postures and light change mightily from moment to moment. But there is still time to plan a shot. Yes, your reaction time is measured in seconds, but there is time. More importantly, you can change your mind about whether to try something. You have direct influence over what’s planned and attempted. The camera is carrying out your commands. That’s the important part: they are your commands. The shot you see here is the product of about fifty shots that were either deleted on the fly or winnowed out in the editing process. But I know what they are because I shot them. That’s not my vanity talking: it’s just the difference between learning to trust yourself and handing that trust over to the machine. For me, the choice is simple. NO ONE EVER INTENTIONALLY DESIGNS SOMETHING TO BE UGLY. There has never been an artist’s or architect’s rendering that shows a project, from a city park to a shopping mall, as anything but ideal. Drawings created to excite investors and planners are consistently festooned with bright, broad sidewalks, strolling families (with their dogs), and bowers of flowers. When you see a sign saying, “coming soon on this site”, it’s always a sunny day. Of course, once the dedication ribbon is cut, reality intervenes. Neighborhoods rise and fall. Things wear out. The cool things that were to be built during “phase two” get un-funded. The dream of the possible becomes the dreariness of the actual. And photographers are there to measure the distance between those extremes. Sadly, merely making images of what has gone wrong in modern life is almost a default for many shooters, and their predictably bleak work reflects that. Creating pictures of decay or failure is certainly easy, almost a cynical cop-out, as if seeing the ugliness in things is somehow more honest, more “authentic”. I can understand taking that bait. I have taken that bait. But I think photographers need to struggle to confer grace on things as well, to try to show how things might have worked out. Yes, there’s a lot of drama to be had in documenting what went wrong. But, at one point in the process, before the beginnings of things, people invested faith in what they were creating, a faith that said that things would be generally better Once This Thing Is Completed. Pictorially, trying to portray potential, especially wasted potential, is far tricker. As to the image shown here, I’d like to say it was the result of some marvelous act of planning, but the fact is, the entire scene, bathed in the deep golds of dusk, was seen and seized in an instant. I remember being struck by the feeling that this kind of light was so miraculous that it could confer nobility on even a car wash in a shopworn neighborhood, and that a momentary break in the clouds had given the reds and yellows the hyper-saturated look of an old, slow film stock like Kodachrome. Again, all these impressions registered inside a few seconds, and I went for it. 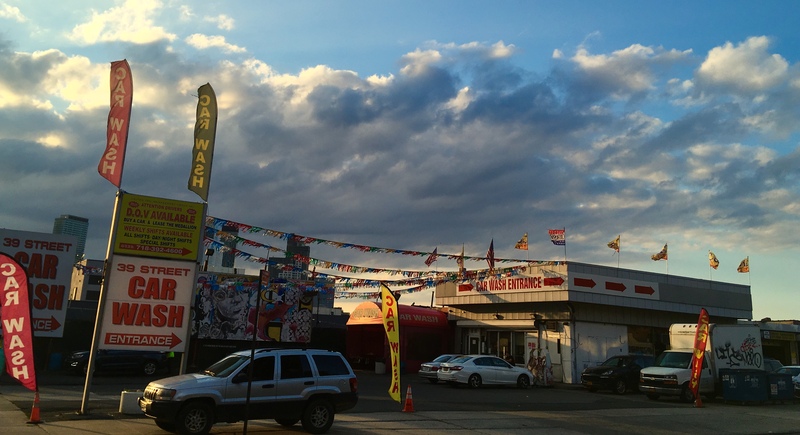 The result reminded me that, once, someone thought this car wash would at least be neat, or efficient, or attractive. Sometimes that dream is totally submerged in the crust of What Happened Later. But I feel compelled to search for it anyway, to confer grace on what the dreamers saw. After all, under the skin, we’re all in the same game. ALL OF WHAT WE CALL “EFFECTS” LENSES can additionally be used as “art” lenses, but they can also, for a photographer, merely be a way of saying, “hey, look at the cool trick I learned!” In what and how we shoot, we draw the line between “showing something” and just showing off. Since no single lens can produce every desired optical look, we swap out speciality glass to get the effect we want in a given image. But is the final picture complemented or defined by that effect? Is the photograph “about” how close you zoomed in, or what you zoomed in to see? Did you shoot with a stereoscopic lens just to demonstrate 3D, or is there some deeper understanding of your subject achieved with the added sensation of dimensionality? You see where this is going: the yin and yang between calling on technique and calling attention to that technique for its own sake. In trying to be mindful of this either/or way of using effects gear, from macro filters to pinhole lenses to ultra wides, I try to use some of them counter-intuitively, forcing them to tell stories in ways that go beyond the obvious. 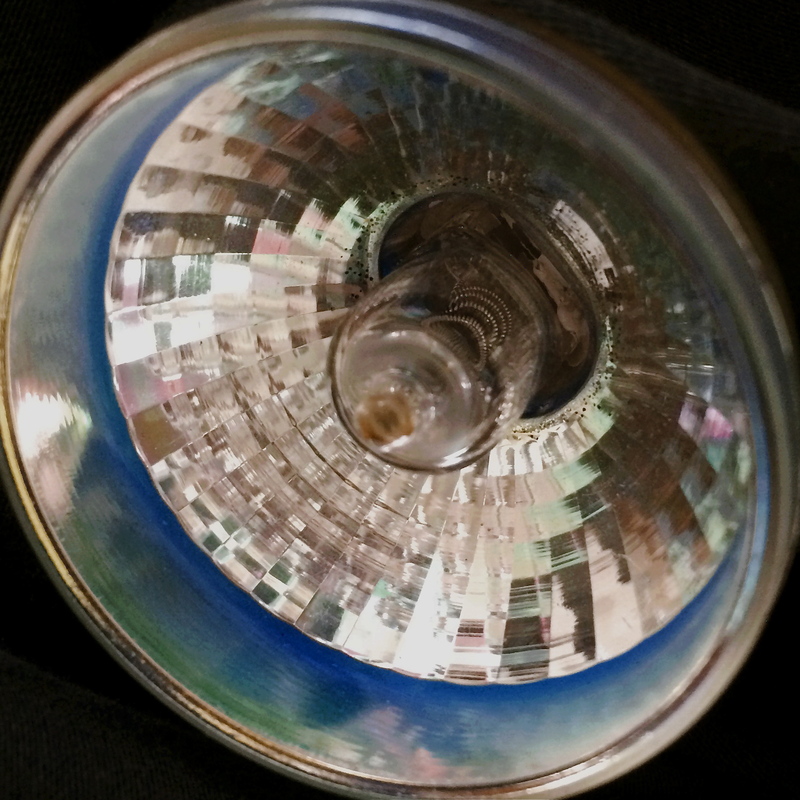 One such lens, and one which comes with its own set of pre-conceptions and biases, is the fisheye, which, for many, never left the bendy realm of psychedelic album covers and black-light posters, time-locked somewhere between Warhol and Peter Max. However, even in the most exaggerated fisheye shots there is the opportunity to create what I call “calm at the center”….an area roughly one third of the total frame where distortion is either muted or completely absent. 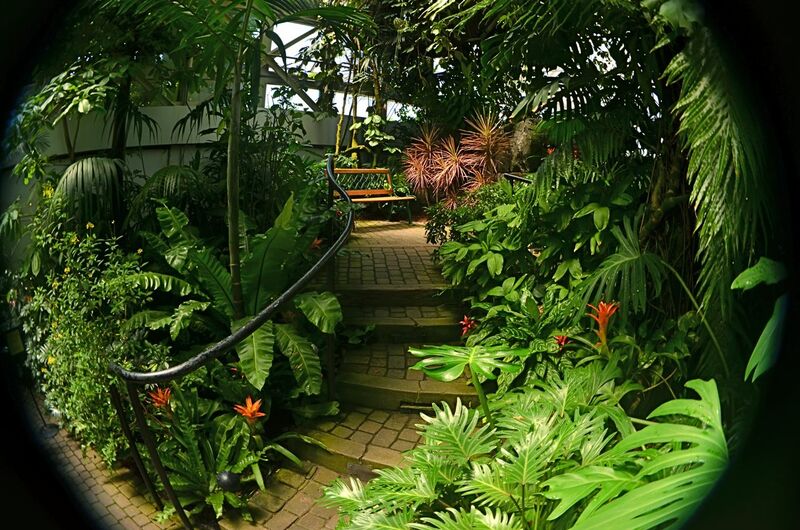 When a compelling and more normally proportioned middle is built into your shot, such as the stair steps leading toward the bench in this greenhouse shot, the bending that increases toward the outer edge of the shot can act as a framing device that leads the eye to your chief focus. The emphasis can then be placed on what is not distorted rather than what is. The fisheye lens is thus used to call attention to what it’s serving in the picture, rather than calling attention to itself. Does this shot deliver what I was seeking? That’s for others to judge: the only thing I can be sure of is my intention, after all. Effects lenses are not automatically art lenses, any more than every camera owner is automatically a photographer. Results, finally, are the best testimony. “STRANGE” IS IN THE EYE OF THE BEHOLDER, and anytime you and your camera are, in terms of travel, the new kids in town, your time as a street shooter is better spent finding the “weird” things that the locals find….normal. Now, let’s be clear: many times towns will capitalize on their World’s Biggest Ball Of Twine or haunted house tours or such, but that’s just naked capitalism, and everyone deserves to make a fast buck wherever they can. No, the local weirdness you want is something that’s been odd for so long that it’s not only normal to the locals….it’s damn near invisible. Of course, I concede that one photographer’s instance of Undiscovered Ironic Hipness is another’s Tourist Sucker Bait. 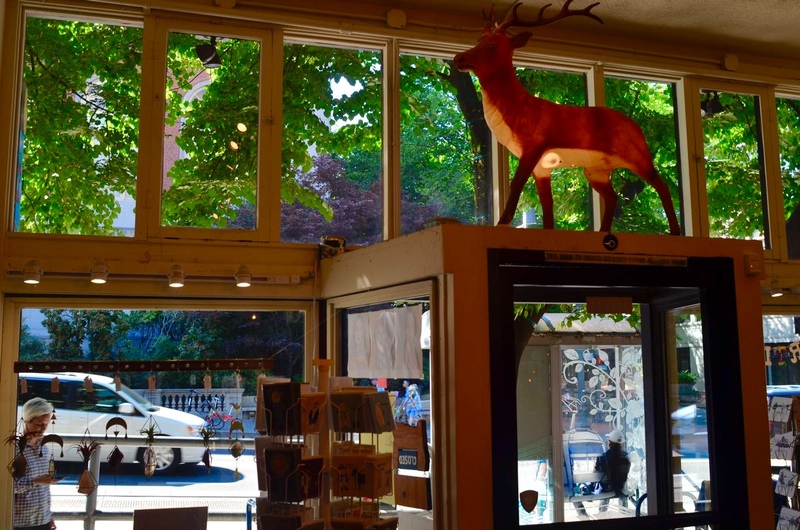 This can be an additionally tough call in a town like Portland, Oregon, a town practically marinating in ironic hipness, so the things about the city that recently tickled my fancy may, to real Portlanders, be beneath both notice and contempt. To be sure I was on the right track, I would have to actually be cool, and, sadly, that ship has not only sailed, but it’s struck an iceberg. And, again, I repeat, how the hell should I know? My only point is that, when I’m trolling new streets with a camera, I’d rather bypass the sites that the local chamber of commerce is telling me are “points of interest” and try instead to find where the quirkiness truly meets the road…in local shops, bars, neighborhood celebrations, or improvised “traditions” that make a city unforgettable. WHATEVER THE PERCEIVED DOWNSIDES of the switch from analog to digital photography, perhaps the only real net negative has been how speedy the process of picture-making has become. Yes, I said negative. Admittedly most of that vaunted speed connotes as a positive to many, a miraculous convenience. And, indeed, progressively more responsive, even “intuitive” cameras produce usable images only slightly slower than their creators can hatch a whim. Want it, take it, got it. Fast. But “usable” doesn’t necessarily mean “great”. And it can be argued that the sheer velocity at which we crank out photographs promotes, even guarantees a stunning yield of photographic mediocrity. 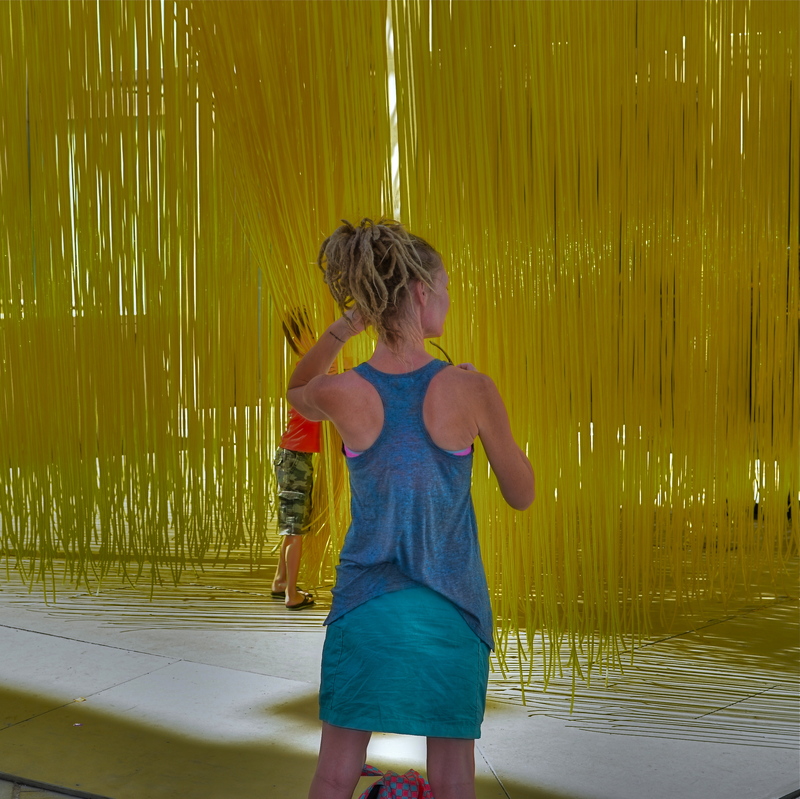 Because art takes forethought, a pre-imagining discipline. And there is no way to achieve that if every picture, every time, is taken in an instant. Eventually, photographers have to proactively take back control over their final product, by the simple expedient of slowing everything down. And there are any number of simple ways to practice this. Shoot on manual. Set aside the zooms and shoot with primes. Engineer more natural light shots in lieu of flash snaps. Keep one particular lens on your camera for a month and force yourself to shoot everything with it. In short, make the process harder, not easier. Make yourself uncomfortable. One of my favorite mindfulness exercises come from shooting macro. It’s harder in every way from any other kind of work. Focus, composition, lighting and exposure are all exponentially more difficult at short distances, and that means a higher harvest of bad pictures(the photo shown here was the lone survivor among twenty frames). And that’s good, because that, in turn, makes it impossible to settle for your first frame. Or your twenty-first. And that means you have to try, adjust, compare, re-try. It takes time, all of it educational. But first you need to escape the realm of Snapshot Mind, a fun and carefree play land that digital makes especially seductive, but which can become a trap. Of course, there is the phenomenon called “first thought, best thought”, in which amazing, fully realized images come right out of the chute, and very quickly. And there is no guarantee that, by simply taking your time, you will always use it wisely. But creating situations in which you must be more present, more deliberate, will, more often than not, show you how to shape and then re-shape your vision. Turns out Rome really wasn’t built (or photographed) in a day. SINCE I FIRST WROTE, several months back, about using my cellphone as a “sketch pad” for the first versions of images I would later finalize on a more adjustable camera (SLR, mirrorless, etc. ), I’ve seen quite a few photographers confess to the same practice. As I said before, it’s not as if the cell isn’t a “real” camera, but that working with it is less mentally formal, less hemmed in by strict rules, than the cameras many of us cut our teeth on. At present, cells promote a more spontaneous, improvisatory approach to picture-taking: we produce work very quickly, and even our bombs have a short learning curve. We then make a second pass at the most promising “sketches” with cameras that both promote and reward deliberation. Now I’m enjoying yet another variation on this formula as I play with the first instant film camera I’ve owned in nearly forty years. Optically, my Fujifilm Instax 90 is less precise than my mobile phone, and miles behind a full-function SLR. However, the “feedback loop” from snap to physical print rivals the turnaround time of a cell, and I have used some of these medium-fi images as dress rehearsals for shots that only my more advanced cameras can properly finesse. The main difference here is working with film, which translates to how fast and how freely I shoot. Cels are technically limited, but you can shoot endlessly for free, so it’s tempting to experiment without regard to anything except the moment: very intuitive. By comparison, film is finite. More importantly, your shots, both home runs and strikeouts alike, all cost money. If you’ve never shot film (ya young whippersnappers!) it’s really a trip learning to “budget” your shots, weighing all the stuff you want against the physical limit of shots you actually have to work with. Old guys like me had lots of reasons to desert film for digital, but being freed from the tyranny of the wallet was my personal Numero Uno. So, if you follow this strange line of reasoning, here’s where we stand: an instant film camera gives you a fast result, but the low volume of output (just ten shots per pack of Fuji Instax Mini film) and the cost (nearly a dollar per shot) means that you will be shooting slower and more deliberately than with a cel. You’ll be actively planning your shots, editing your projects on the fly, and producing a smaller yield of “possibles” to refine with a higher-end camera. Or you might do such a bang-up job with your film sketch pad that you produce your ” keeper” right then and there. 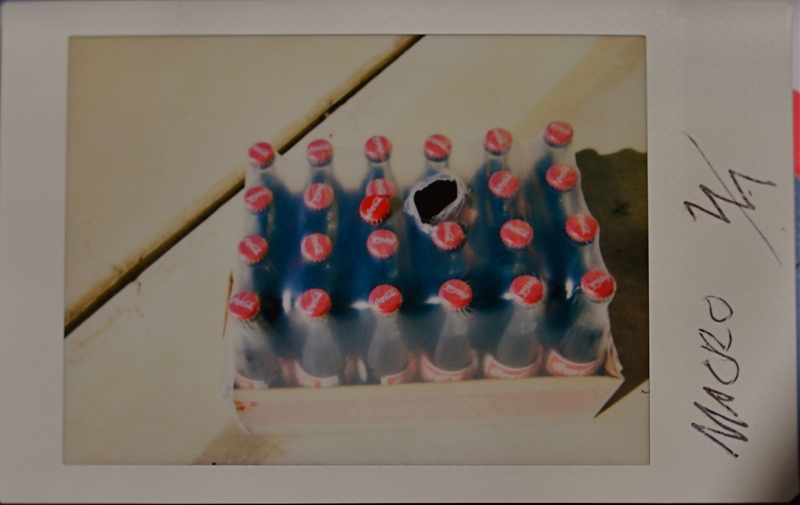 In the two cases shown here, the Instax shot shows me that the central idea (the punctured shrink wrap atop the carton of Coke) can be improved by including a spent bottle on the side and tightening up the frame, allowing my Lensbaby Velvet 56 to show the textural variances in surface tension, something the Instax isn’t precise enough to do. The Lensbaby can also deliver a wider range of tones and deliver sharper focus, albeit within a soft glow. Will this tortured method ever become your own? Really doesn’t matter. Your results may vary, as the man says, because they are yours. There are many routes to the promised land. Take the expressway or slog along the old dirt road. Just get the shot. NO SOONER HAD THE INFANT ART OF PHOTOGRAPHY asked the world of the 1800’s to trust it as the ultimate in visual verity (the camera doesn’t lie!) than it also began to turn itself into the most unreliable of narrators. Truth-telling and bald-face lying grew up side-by-side in the picture-making world, and they have been conjoined twins ever since. If P.T. Barnum was right that “there’s a sucker born every minute”, then certainly every one of those chumps has had his very own faked photograph. Some of the fraud has been benign, as when Julia Margaret Cameron dressed up her friends to portray the great authors and heroes of history, or when landscape artists combined seashores from one negative with clouds from another for a pleasing montage. Other fakes were more sinister, with nations manufacturing claims of war crimes against their foes or tabloids “proving” conspiracy theories with massaged “evidence”. And somewhere in the middle has always been the “that’s not real, is it?” photo, something which we can’t allow ourselves to either believe or resist, the charming charlatan, the obvious put-on. Barnum and his bunch were fairly coy about their fakery, filling the first era of mass-produced press photography with doctored images that were literally too good to be true and challenging all comers to verify their veracity. Today, fakes are more ironic than compelling, since the tools to concoct them are so universally available as to make them commonplace. The object isn’t so much to actually fool anyone, but to comment on how easy it is to make the camera lie. Years after Barnum’s death, the circus that later bore his name actually made a half-hearted attempt to concoct its own “unicorn” for its shows, something even the great humbug himself never did. 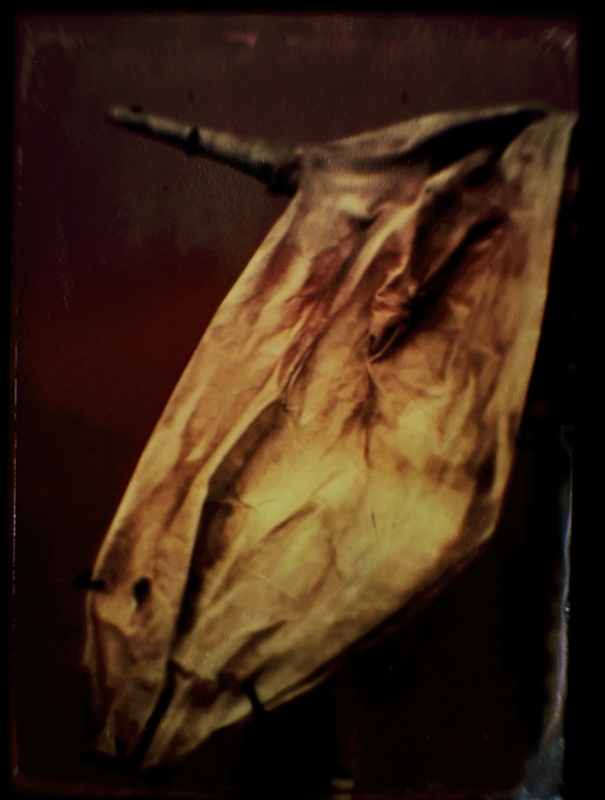 Using a phone app, indifferent lighting and focus, and the freakishly arranged shape of an old bagpipe on display at Phoenix’ Musical Instrument Museum, I worked up a reasonable fake tintype of a unicorn’s mummified head, the like of which might have graced the master showman’s old dime museum. It took me about five minutes. The main difference between the fakery of the Victorian age and the variety we practice today is that, in the 21st century, the fakers, myself included, confess right away. We want to get the points for being oh, so clever. And since you know we have the means to show you anything, we already know you believe almost nothing, so it’s no longer about convincing you a unicorn exists. It’s about the ride. Photography didn’t just arrive at the place where truth is negotiable, anymore than fiction just recently became about “making stuff up”. We pitcher folk have always been, to a degree, untrustworthy. But as Barnum said, “the bigger the humbug, the better people will like it”. Hurry, hurry, hurry…… step right up…. Neither viewpoint can go it alone. Without reality as a reference point, flights of fancy float off into chaos. Conversely, without a sense of whimsy, the gravity of the world can make a photograph leaden and moribund. Let’s face it: dreamers and didacts need each other, and complement each other within a single picture the way fat flavors lean meat. Moreover, trying to attenuate a customized mix of these two disciplines is the real fun in photography. I’ve been fascinated of late by the new surge of interest in manual typewriters. It’s the same longing for recently-departed technology that’s fired a revival in film and the rebirth of vinyl lps. We are moving so quickly forward in some ways that we are understandably reluctant to regard every part of our past as dispensible ballast to be jettisoned on the way to some perfect Futureworld. And so we linger a while. We prolong our goodbyes a bit. Some writers have recently renewed their love affair with the clack and clatter of the mechanical keyboard, marrying its noise, heft, and bulk to a kind of seriousness, as if a story or essay were somehow more authentic if pounded out on an old Royal or Smith-Corona. The recent documentary California Typewriter takes its title from a scrappy repair shop that survives to the present day by restoring old beaters for a new crop of trendy customers who either admire the sheer engineering wonder or the mystical oomph it confers on their scribblings. High-profile adherents like Tom Hanks, John Meyer and David McCullough rhapsodize about the contours, keyboard height, and return bell of their respective treasures. It’s great fun. Photographically, I started to explore just how far the idea of the typewriter-as-magical-device could be stretched. Would it endow the user with the ability to solve knotty equations? Conjure ingenious recipes? 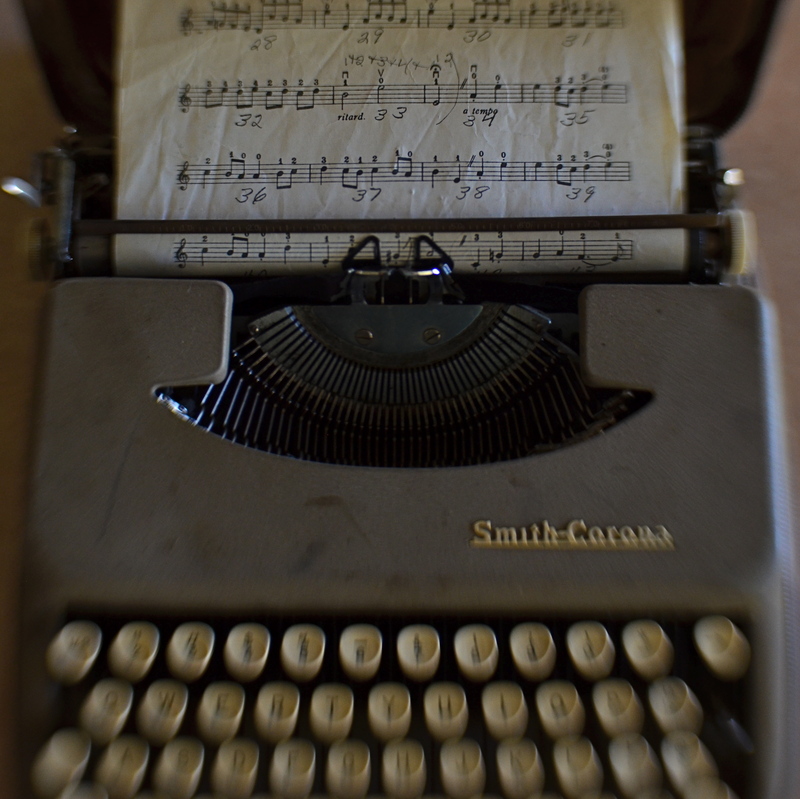 What if the typewriter had unilateral power to enhance the creation of anything, even melody? What kind of typewriter might help Mozart crank out a concerto? Would his greatest works go mid-performed for centuries just because he transposed certain keys? And what would that process look like? Carry Out (2017). 1/50 sec., f/4, ISO 640, 24mm. EVERY TIME I SEE SOMEONE working on a jigsaw puzzle, I can’t help but think that they’re missing all the fun. The idea of the project is, of course, to assemble enough pieces of a scene that it becomes recognizable. 200 pieces in: some kind of structure. 400 pieces in: looks like it’s made of iron, triangular maybe. 600 pieces in: oh, yeah, the Eiffel Tower! But, whereas a picture puzzle is solved when the image looks complete enough, my favorite kind of photography centers on how few pieces of the puzzle can be supplied and still have the image communicate to the viewer. Formalists might call this minimalism: art curators might label it cubism: holy men in flowing robes might use the term zen. I just think of it as reducing pictures to the smallest number of components needed to convey ideas. In fact, many photographic subjects actually present themselves in a kind of broken pattern right out of the gate, challenging us to create images from the spotty data they let through. 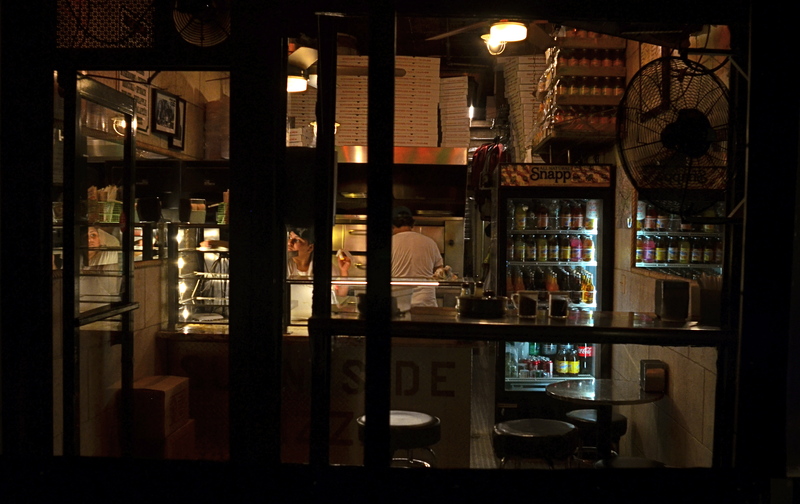 For example, views through partially blocked windows, such as the one at the top of this page, in which what remains readable behind the darkened door and window framings, is more than enough to sell the message pizza shoppe. For me, having everything spelled out to the Nth degree in a photograph is beyond boring. It’s much more interesting to engage the viewer in a kind of partnership in which he is looking on purpose and I am trying to maximize the power of my pitch, going as far beyond the obvious as I can while not letting the picture fly apart. The first minute I’ve snapped enough pieces into the puzzle to suggest the Eiffel Tower, I’m ready to leave the last 300 pieces in the box. THE BEST PHOTOGRAPHS ARE NOT STAND-ALONE WORKS OF ART, BUT CONVERSATIONS BETWEEN ARTIST AND AUDIENCE. You don’t just stride up to that framed image on the wall and let its wonderfulness wash over you; you bring what you have been, over a lifetime, to it, comparing those two entities side by side, and even assigning your own truth to the photo, “deciding” what it means. The pictures don’t speak to you: you debate with each other. Think about the images that, over a lifetime, have reached you in the deepest way. Did those photographs bring you something that you didn’t already have, or was it echoed, defined, re-purposed, based on who you’ve been thus far, or how you see? How else to explain why a picture moves one person to tears, while it leaves another completely nonplussed? Of course, some photographs almost accidentally produce a similar result to a wide variety of viewers, but there are far more of them where the messaging is muddled, imprecise. One way to repurpose a photograph is to make it part of another photograph. Or not. I made the above image several days ago purely as an experiment, using an earlier one of my pictures as a prop within what’s obviously a staged shot. The completed “new” photograph was part of an assignment by an image sharing group I belong to, which laid down several elements that had to be in the final picture: a hand covered by something, that same hand touching something, and a de-saturated color palette. Beyond that, I had complete control of how those elements would be combined or interpreted. The reason I began to play with some older pictures was chiefly to see if I could take a photo made with one specific mood in mind and re-purpose it within a new context, making the image elicit something completely different. So, without further background or explanation, the challenge to you: what does this particular image (which has an older image within it) convey to you, if anything? What is the dominant mood or the implied backstory? And even if what you’re seeing is not the same as what I set out to “say”, does the picture have any relevance for you personally? Does it have any narrative value, or is it merely an exercise in technique? Context isn’t everything in a photograph, but neither is any image is absorbed in a vacuum. We color our approach to it in some way, becoming, in essence, its co-creator. You may not be in the frame, but you’re definitely in the picture. THE MAKING OF A GOOD PHOTOGRAPH IS A CHALLENGING ENOUGH ENTERPRISE that it’s understandable that many a photographer loses either his emotional balance or his sense of humor or both in the process. As artistes, we are so very, very earnest in our pursuit of the image that we can become a little, well tedious. All work and no play makes Jack take four hours to take a picture. I always believe that, when you are mired in a problem, the bravest thing you can do is to, well, run away. Call it play, call it goofing off, call it cleaning out the pipes, or call it late to supper: the idea is to change the conversation. Of course, if you’re physically stuck in a rain-soaked duck blind awaiting the annual return of the pied-billed grebe, it’s a little tough to break camp (or your concentration) for the salvation of play. Besides, if the pied-billed grebe is your idea of a good time, then godspeed, John Glenn, and please don’t expect us to sit through your slides upon your return. Not without beer, anyway. Suddenly, Flash Held The Upper Hand (2017). Heavy on the nonsense. Because sometimes you need it. No, I’m talking about the value, the actual soul-salvaging power of stupid. 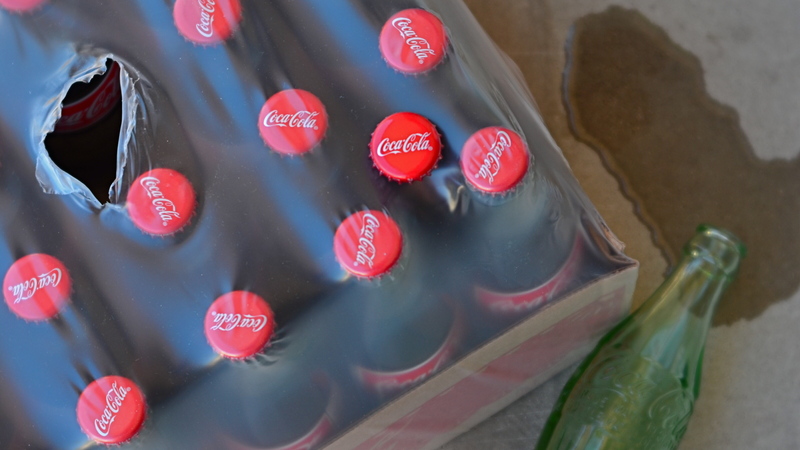 The palate-cleansing function of creating the visual equivalent of a stuck-out tongue. In taking the time to solve the problems involved in the creation of a “dumb picture”, you are also exercising the muscles of your mind that have been cramped up in your more serious work. I’m reminded of the process used at the little building on the weird end of the Warner Brothers lot where Looney Tunes shorts were created. It was a working method which startled messengers and delivery boys alike, who often entered the office to see Chuck Jones, Friz Freleng, and other animators capering about in animal costumes or funny hats as other Tuners recorded their gyrations with 16mm home-movie cameras, the better to animate you with, Grandma. Now some of you troublemakers might be tempted to remark, “but they were making cartoons. How is that serious work?”, to which I reply that perhaps you and I had better take this outside and settle the matter like gentlemen. 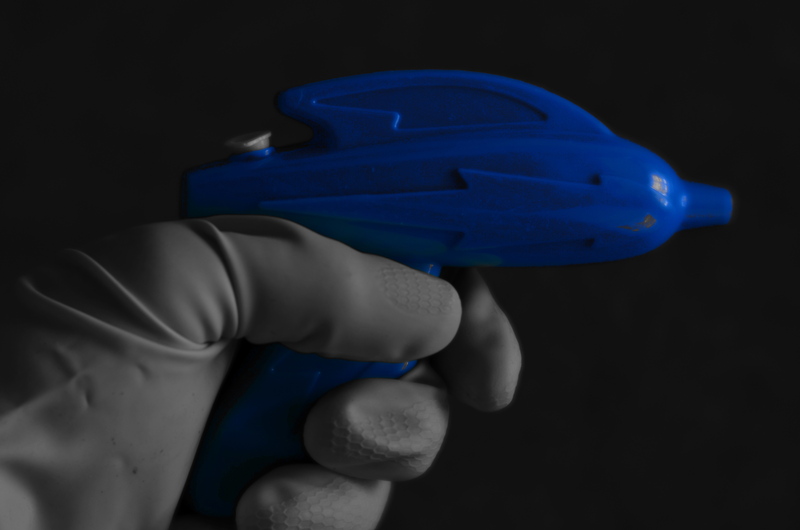 The above shot is the result of one dollar in investment (the weird squirt gun, complete with cosmic lighting bolt), a little rooting around under the sink (for the work glove), and ten minutes of fanciful fun. Not being fortunate enough to have Buster Crabbe here to model my fantasy (he’s in Actor Hell learning how to better deliver his lines), I managed to use my own left hand to wield my weapon while shooting with my right. And if you think you can do that without looking stupid….well, I’m just as glad the wife didn’t walk in on me, especially since I had been tasked, on this particular day, with kitchen duty. Which is all to say, as if it needed repeating (or even peating) that fun is essential to the process of photography. When the well runs dry, you’d better re-fill it quick…with water, Mr. Bubble, Cherry Kool-Aid, or a nice, refreshing bucket of stupid. I AM TRULY THANKFUL FOR MY PHOTOGRAPHIC FAILURES. And it’s right that I have a benevolent attitude toward the pictures I’ve muffed, since there are so many of them. As a photographer, you pray for the kind of analytical ruthlessness that you need to separate wheat from chaff and label your duds as duds….no excuses, no explanations, no magical thinking that, left in a drawer long enough, these rotten seeds will someday bloom into roses. Once you can call your own stuff worthless, you’re truly on the road toward making something….well, less so. I have just spent a week giving the (overdue) pink slip to my last and largest remaining archive of really, really bad pictures from the twilight of the film era, about 400 35mm slides that I have been hauling around the globe since the late ’90’s, and none of which, surprisingly, have blossomed into masterpieces since the last three times I pulled them out, shrieked, and sealed them back behind brick walls. Funny how that happens. The (somewhat less than) Mighty Argus 3D film camera of the late ’90’s. shown here with its print viewer. Jealous? This errant tonnage represents my first attempts with 3D photography, which involves a huge learning curve, not to mention a pound and a half of heavy-duty study. At the time I began this journey, very few stereoscopic cameras were available for sale, and the ones that produced the effect the best were also the most technically limited. 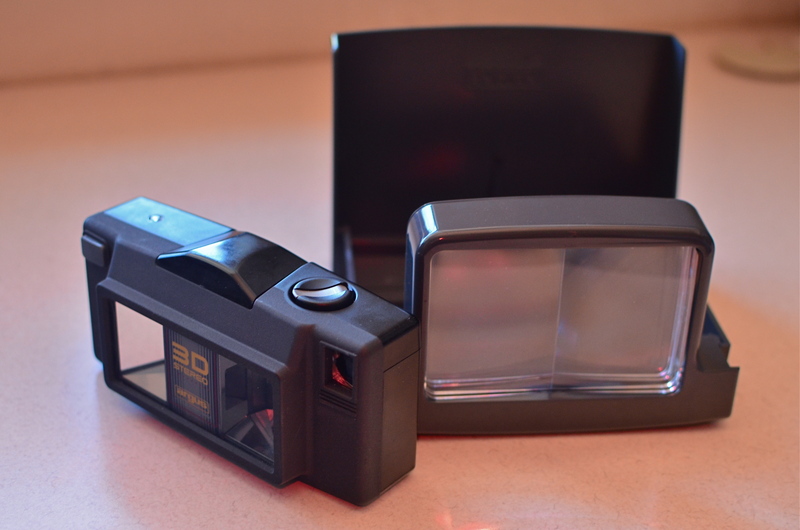 The Argus/Loreo 3D, my toy of choice, was, in fact, a point-and-shoot 35mm with only two apertures, since the additional depth of field at f/11 and f/18 produced the best stereo illusion. 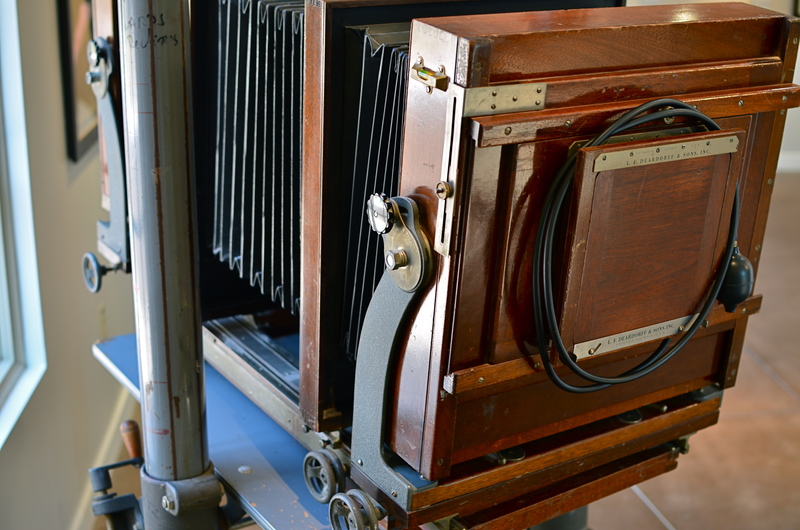 The Argus was produced to create 4 x 6 prints (which you actually had to pay to have printed, remember), each featuring two side-by-side images viewed through a prism holder. It was not intended for high-end art use, since the lenses were frozen at 1/100, there were no additional optics available, and a usable result could only be achieved outdoors, in full daylight. Worse, I stubbornly decided to shoot slide film in the thing, thus creating a whole separate set of problems for myself. First, were processors supposed to produce both images in the same slide? Well, sure, yeah, they could do that, but how was I going to view them? No worries! Turns out that other fools like me had also shot so-called “half-frame” stereo slides over the decades, and some of the viewers made to serve them were still on Ebay. Of course, I was shooting daylight slide film at 100 ASA in all conditions, and I didn’t yet know enough (or have enough money) to instruct processors on how to “push” the slide film an extra stop or two just to make them a trice lighter, so most of my shots were murky mysteries even Sherlock Holmes couldn’t decipher. Worse, anyone shooting stereo must learn to compose for the depth effect, something you can only master by taking lots of lousy pictures (I did) or agreeing to take pictures of boring garbage just to attain said effect (did that, too). Add to this that you only had half of a 35mm frame in which to compose and you start to see what a raging success the whole enterprise was destined to be. At one point, I even went so far as to slice the twin images apart, re-jigger them in super-wide slide mounts, find an antediluvian projector that projected those kinds of slides ($$$), then search the globe again for viewing glasses that would allow me to see the projected slides in 3-d. Getting tired yet? So, farewell to scads of badly composed, boring and unviewable slides, a grim reminder of how expensive and unwieldy large projects were in the film era. Post-script: I eventually thrived by learning to make my own View-Master reels (still expensive and work-intensive, but there’s a reason the format has been around nearly seventy years). At least the entire fiasco finally made a real editor out of me, teaching me a most valuable mantra: bad is bad is bad is bad. Some seeds will never become roses. I REALIZE, MORE THAN EVER, THAT THE BULK OF MY OWN PHOTOGRAPHIC WORK has been an attempt to tell human stories while using remarkably few humans to convey them. I always seem not to have a true style at all, just a string of endless experiments that either add or detract from my overall skill set. And yet, if there is any “signature” in my work, it seems to be in using objects, or atmospheres, to illustrate what makes (or made) people feel. The everyday “sets” on which the actors of life play their parts. The oddest thing about my photographs is how many times, over a lifetime, the sets are allowed to speak for the actors, without the actors present. 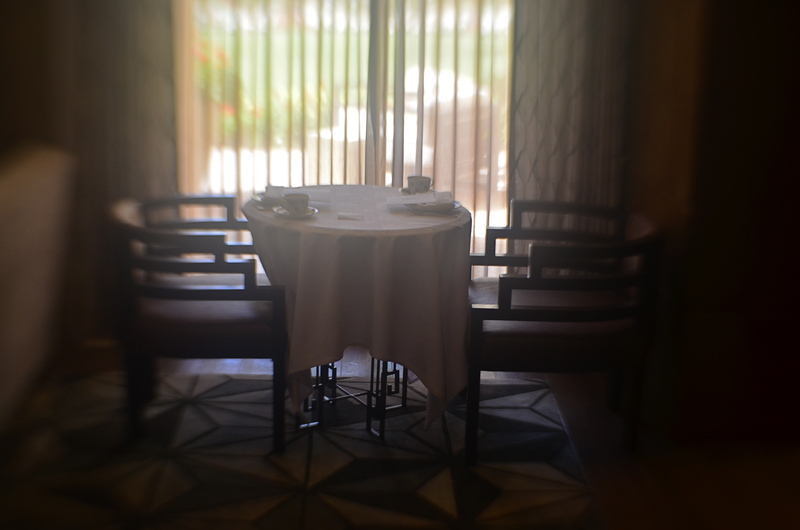 I shoot empty rooms, but rooms where I feel the weight of years of bustling, traffic, conversations, meetings. I shoot solitary objects on tables, but objects that I imagined were touched, treasured, and otherwise served to measure daily life. I’m not adept at staging people as models or actors in images, but I try to react to settings, see people in them, and show their absence as a kind of presence through these things, these places. It doesn’t always work. And, as you all have, I’m sure, I often worry about whether I’m off on the wrong track, lost, kidding myself. When a photograph connects with someone, I’m still surprised, even shocked. Street photography, which I greatly admire, is, for most, the act of seeing important bits of drama or tension between people. I take the visual measure of what they build, what they use, even what they abandon, and try to draw their portraits that way. The actual participants may, or may not, be part of those drawings. Like I say, it doesn’t always work. What I may see as a moment of contemplation or a quiet narrative may strike others as cold, remote. I never mean it that way, since that’s not how I see the world. To my mind, you can either show a child opening a Christmas present, measuring his first flash of joy, or you can photograph the box and wrapping paper a moment later, after the toy has been removed and only the potential of the thing is left behind, like a latent fragrance. I like trying to detect those fragrances, those lingering essences, the vapors of vanishing potential. Like Chief Dan George observes in Little Big Man, sometimes the magic works and sometimes it doesn’t. URBAN PHOTOGRAPHERS ACT IN MUCH THE SAME WAY AS ARCHAEOLOGISTS in that they must try to supply context for objects, backstories that have been either altered or erased. Cities are collections of things created by humans for specific motives, be it profit, shelter, play, or worship. Often, the visual headstones of these dreams, that is, the buildings, survive beyond the people that called them into being. Photographers have to imply the part of the story that’s crumbled to dust. Like the archaeologist, we try to look at shards and imagine vases, or see an entire temple in a chunk of wall. During the dreaded “urban renewal” period in the mid-twentieth century, my home town of Columbus, Ohio duplicated the destruction seen in cities across the country in the wanton devastation of neighborhoods, landmarks and linkages in the name of Progress. Today’s urban planners thumb sadly through vast volumes of ill-considered “improvements” wrought upon history from that period, with New York’s Penn Station, Pittsburgh’s Forbes Field, and Columbus’ Union Station surviving today only as misty symbols of fashion gone amok. In the case of Columbus’ grand old railroad station, there is at least a fragment of the original structure, its beaux-arts entry arch, left standing, serving as either stately souvenir or cautionary tale, depending on your viewpoint. The arch has been moved several times since the demolition of its matching complex, and presently graces the city’s humming new hockey and entertainment district, itself a wondrous blend of new and repurposed architecture. Better late than never. Thus, the Union arch has, by default, become one of the most photographed objects in town, giving new generations of artists permission to widely interpret it, freed, as it is, of its original context. Amateur archaeologists all, they show it as not only what it is, but also what it was and might have been. It has become abstracted to the point where anyone can project anything onto it, adding their own spin to something whose original purpose has been obliterated by time. I have taken a few runs at the subject myself over the years, and find that partial views work better than views of the entire arch, which is crowded in with plenty of apartment buildings, parklands and foot traffic, making a straight-on photo of the structure busy and mundane. For the above image, I imagined that I had recovered just an old image of the arch….on a piece of ancient parchment, a map, perhaps an original artist’s rendering. I shot straight up on a cloudy day, rendering the sky empty and white. Then I provided a faux texture to it by taking separate a sepia-toned photo of a crumpled piece of copier paper and fusing the two exposures (the HDR software Photomatix’ “exposure fusion” feature does this easily). 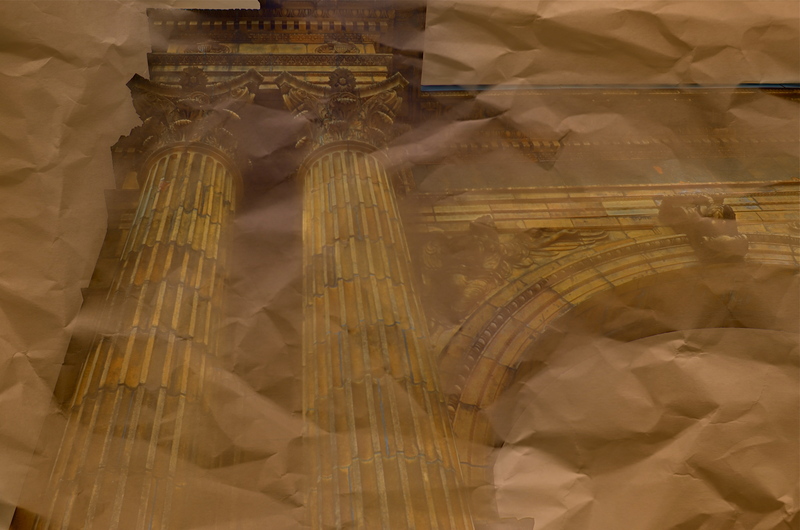 Letting the detail of the arch image bleed randomly through the crumpled paper picture created a reasonable illusion of a lost document, and I could easily tweak the blend back and forth until I liked the overall effect. Cities are treasure hunts for photographers, but not everything we find has to be photographed at, let’s say, face value. Reality, like fantasy, sometimes benefits from a little push. Taking control of your photography can be a daunting process. VISITORS TO THE FACTORY HEADQUARTERS OF BEN & JERRY’S ICE CREAM in Stowe, Vermont, upon completing the standard tour of the works, are encouraged to climb a small hill out back of the building to view the company’s Dead Flavor’s Graveyard, an actual cemetery, complete with elegantly epitaphed tombstones and dedicated to such failed B&J varietals as Turtle Soup, Fossil Fuel, White Russian and Sweet Potato Pie. It’s a humorous way to point out that, even for talented startups, there’s no such thing as a direct shot up the mountain of fame. We duck. We detour. We change direction. It’s a process, not a product. Photography is, in this way (and in no other way that I can think of) much like ice cream. As we clear the 500 mark on posts for The Normal Eye, I want to (a) profoundly thank all those who have joined us on the journey, and (b) restate that, as our sub-head reads, it really is about a journey, rather than a destination. This small-town newspaper began because I had met so many people over the years who had become suspicious of their camera’s true intentions. Sure, they admitted, the automodes do pretty great on many pictures, but what if I actually want some say in the process? Can I be an active agent in the making of my own pictures? Now, these weren’t people who wanted to purchase $10,000 worth of gear, sell their houses, abandon their children, and become photo gypsies for NatGeo. These were simply people whose photographic curiosity had finally got the better of them. What would happen, they asked, if I were to, all by myself, make one little extra choice, independent of the camera’s superbrain, before the shutter snapped? And what if I made two? Or three? Other questions followed. What is seeing? How do you learn to value your own vision? And what tasks from the era of film still apply as solid principles in the digital age? The Normal Eye has spent the last four years trying to ask those questions, not from a top-down, “here is how to do it” approach, since so many of these solutions must be privately arrived at. This is not, and will never be, a technical tutorial. I reflect on what thoughts went into a particular problem, and how I personally decided to try to solve it. The results, as are all my words, are up for debate. I’m not a fan of words, but the ones in this article are in a tolerable sequence. Hey, that’s enough to hold me for another 500, and I hope you’ll be along for the ride. On Stand-By, 2015. 1/25 sec., f/3.5, ISO 100, 35mm. THE OLDEST CONSISTENT ROLE OF PHOTOGRAPHY IS AS NARRATIVE, its storytelling ability borrowed from painting but later freed, as painting would also be, from representations of mere reality. Before the beginning of the 20th century, photographs held moments, chronicled events, froze people in time. Over the next hundred tumultuous years, every part of the narrative process for all arts would be challenged, shattered and reassembled several times over. We pretend there are still rules that always apply to what an image says to us, but that is really only sentiment. Some photographs simply are. What they are is, of course, both fun and infuriating for creator and audience alike. We wonder sometimes what we are supposed to think about a picture. We take comfort in being led a certain way, or in a set sequence. Look here first, then here, then here, and draw such-and-such a conclusion. 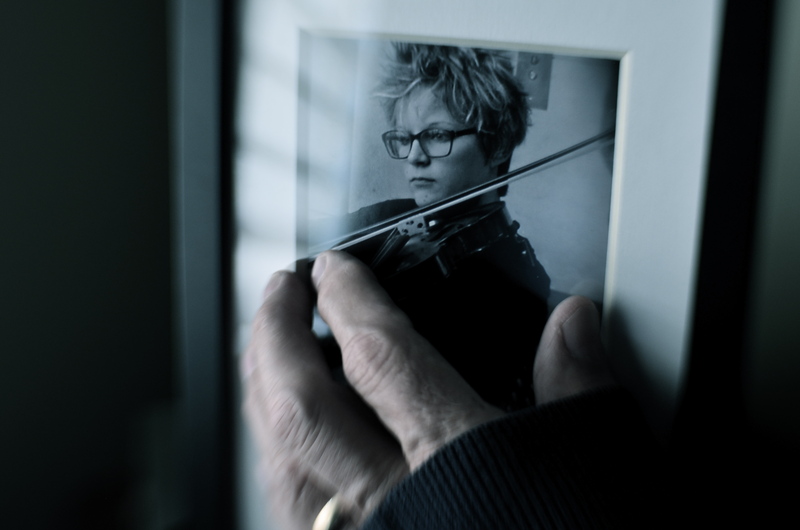 But just as music need not relate a story in traditional terms (and often does not) the photograph should never merely present reality as a finished arrangement. The answer to the question, “what should I think about this?” can only be, whatever you find, whatever you yourself see. Strands, 2015. 1/200 sec., f/5.6, ISO 100,35mm. I love having a clear purpose in a picture, especially pictures of people, and it has taken me years to make such images without the benefit of a deliberate road map. To arrange people as merely elements in a scene, then trust someone else to see what I myself cannot even verbalize, has forced me to relax my grip, to be less controlling, to have confidence in instincts that I can’t readily spell out in 25 words or less. What are these people doing? What does their presence reveal beyond the obvious? Is there anything “obvious” about the picture at all? Just as a still life is not a commentary on fruit or a critique of flowers, some photographed people are not to be used in the service of a story. They can, in the imaginations of viewers, provide much more than that. Photography is most interesting when it’s a conversation. Sometimes that discussion takes place in strange languages. Symphonie Kinetique, 2015. Handheld in-camera manipulation, in real time, of the iPhone’s on-board pano app. I THINK THAT, FOR YOUNG AND EMERGING PHOTOGRAPHERS, there’s a greater natural comfort in coloring outside the lines, bending or breaking rules of the medium just to see what happens, regardless of the warnings of user’s manuals or procedurals. This is completely normal, and is, in fact, healthy for the art overall, as every age’s young turks shake the process up and keep us more hidebound shooters from imprisoning photography in a crust of habit. Phone-based apps play directly to this “what the hell, let’s try it” tendency in the newbie. By their very nature, apps allow people to achieve in a second what used to take years of formal training and painstaking darkroom effort to achieve. This creates the feeling that anything is possible, and that, with the instantaneous feedback loop of digital, there is nothing to be risked or lost by trying. Whenever I get a new app, I try to figure out what it can produce when used completely counter-intuitively, that is, by going in the direct opposite of its “correct” use. Call it a procedural hack if you will, taking one of the most available effects, the iPhone’s on-board panorama app, as a prime example. Now we all know how the app is supposed to work. You pan evenly and slowly from left to right across a scene and a lot of separate vertical “planks”, all of which are individual exposures, are stitched together by the software to give the appearance of a continuous image. You are instructed by the app when to slow down, and given a guide arrow as you pan that keeps you pretty much on an even horizon. And that’s all you’re supposed to be able to do. The Fall Of Europe, 2015. Same technique applied to a wall-mounted photo mural. Of course things can go wrong, and watching how they go wrong is what started me on an experiment. If, for example, someone walks through your shot while you are panning, he may appear in only a few of the “planks”, as a warped, disembodied sliver of his leg or arm, or be stretched like taffy across part of the frame. Thing is, this gives you a neat interpretational option for panos that you want to appear surreal. The idea is to deliberately throw those individual planks out of alignment. Here’s how it works: as you pan, shift your up-down axis either side of that arrow’s horizon guideline. Go gently if you want things to undulate in a smooth wave. Jerk it around a bit of you want to create a seismographic effect, with sharp high-low spikes in your subject. I should note here that this requires a lot of experimentation to get the overall look that you want. In the top image, I wanted to suggest the kinetic energy of musical dynamics in a static image, so I warped the piano keys out of alignment with each other, as if Salvador Dali had painted the keyboard. In the second image, I used the camera to scan a mounted mall mural, allowing me to work with a still image that I could tweak to suggest a collapsing building or an earthquake. Either of these images are easy to do with nothing more than your iPhone’s pano tool, and the effects can be dramatic. So love your apps, but love them enough to imagine what fun it can be to make them misbehave. An enormous public amphitheatre arch at Arcosanti, a crumbling “urban laborotory” near Phoenix, Arizona. PHOTOGRAPHERS HOVER AROUND URBAN RUIN LIKE MOTHS AROUND A FLAME. It’s just a thing that we do. Not by sifting through the ashes of Babylon, Rome or Athens so much as the demolished details of abandoned malls, stores or gas stations. There is a kind of reverence for those banal or ugly things that had their brief moment at the top of the news, then rolled backwards into rot. Shooters love trying to mine ugliness in search of Higher Truth. But when we do this, we’re only doing half the job. A country the scope and breath of America enshrines plenty of greed and stupidity in brick and steel, but so do the near-miss dreamers, the visionaries whose grand prophecies might have made our lives better. They leave behind their legacies of litter no less than the rapacious developers, and they deserve to have those failures immortalized by the camera as well. 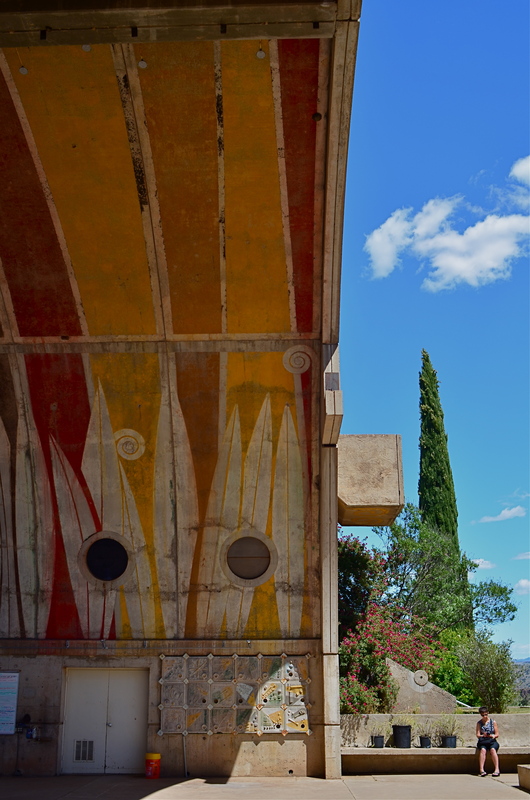 Touring the fifteen-acre architectural tomb that is Arcosanti, a disintegrating “urban laboratory” sixty-five miles outside of Phoenix, Arizona is to see where Disney turns into Dystopia. The miniature model city, conceived by architect and urban planner Paolo Soleri in the 1970’s is, three years after his death, still uncompleted, baking in the desert sun, its proud dream of responsible urban density and communal harmony a hallowed-out echo. While the rest of us wore our vegetable-dye shirts on the first Earth Day, Soleri dreamt of a society where we built up instead of out, chose spirituality over sprawl, yearned to chuck our planet-killing cars for a tight, efficient village designed to give the planet a chance to take a clean breath. It didn’t work, and there are more reasons why than there are residents at Arcosanti, where 5,000 people were supposed to co-exist in ecstasy but where, today, fewer than 60 actually dwell. The common buildings, the amphitheatres, the beehive apartments heated by recycled sunshine still function, after a fashion, but they are losing their battle with nature as the rugged basalt mesas in the neighborhood lash them with harsh winds that peel paint, crack concrete, mock the grand vision. Photographers are reporters, so in our fascination with the ruin of the past, we would do well to document not just the rotted remains of New Valley Mall, but also the places where poets tried to change the narrative. On This Site Will Rise, 2014. 1/320 sec., f/5.6, ISO 100, 35mm. MY PHOTOGRAPHY IS OCCASIONALLY AKIN TO MY GRANDMOTHER’S COOKING METHOD, which produced culinary miracles without a trace of written recipes or cookbooks. Her approach was completely additive; she merely kept throwing things into the pot until it looked “about right”. I was aware of the difference, in her hands, between portions that were labeled “smidges”, “tastes”, “pinches” and even “tads” (as in, “this is a tad too bitter. Give me the salt.) I never questioned her results: I merely scarfed them down and eagerly asked for seconds. Picture making can also be a matter of adding enough pinches and tads to create just the right mix of factors for the image you need. It’s frequently as instinctual a process as Gram’s, but sometimes you have to analyze what worked by thinking the shot backwards after the fact. In the case of the above image, what you see, although it was shot very quickly, is actually the convergence of several different ingredients, the combination of which would be all wrong for some photos, but which actually served this subject fairly well. First, it was taken during the so-called “golden hour”, just before sunset, in late fall in Arizona. That guarantees at least one boost of the building’s native intensity. The next factor is the camera’s own color settings, which are set to “vibrant.” Level three comes from a polarizing filter, which is juicing the sky from its hazy southwestern “normal” to a deep blue. For the fourth element, I am also adding a second filtering component by shooting through a heavily tinted car window (there’s no other kind in Arizona), which presents here as the gradation of sky from blue at the top of the frame to a near aqua near the bottom. 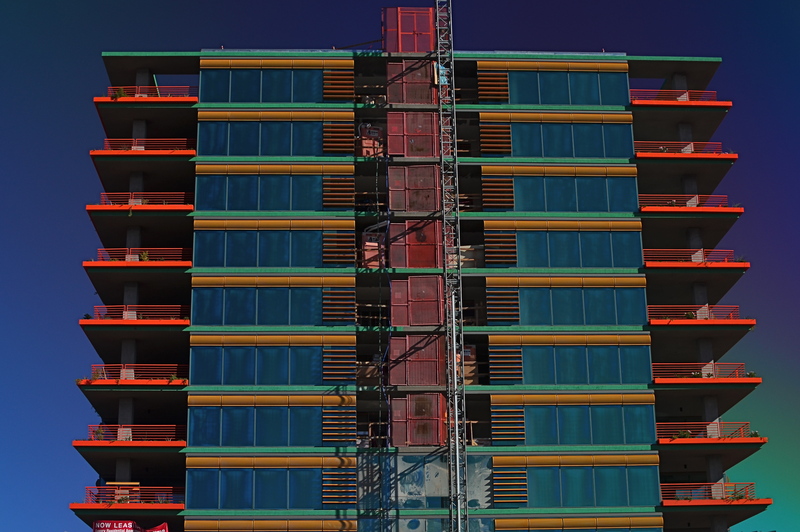 And finally, I am way under-exposing the shot at 1/320, deepening the colors yet one more time. WE ALL REMEMBER ONE OF OUR FIRST VIEWS OF THE MICROSCOPIC WORLD, the intricate latticework of an enlarged snowflake crystal, in all its startling elegance. My own initial glimpse came during the projection of a well-worn 16mm film on a cinder-block wall in a small elementary-school science classroom. From that point forward, I could never hear certain words…design, order, mathematics, or, later on, Bach, without also seeing that snowflake in my mind. Funnily enough, the only thing that didn’t conjure up that delicate crystal were the words snow, snowfall, or snowflake. In some way, the enlarged pattern had become something apart unto itself, a separate thing with no origin, no pre-assigned purpose or definition. It was just a pure visual experience, devoid of context, complete and distinct. I still experience that thrill when using a camera to remove the context from everyday objects, forcing them to be considered free of “backstory” or familiarity. I love it when people react to a photograph of light patterns that just “are”, without bringing to it the need to have the thing explained or placed in any particular setting. The easiest way to do this is through magnification, since many things we consider commonplace are, when isolated and amplified, ripe with details and patterns, that, at normal size, are essentially invisible to us. Another way to do it is to take away the things that the subject is normally seen as part of, or adjacent to. Again, magnification does much of this for us, allowing us to frame a single gear inside a machine or zone in on one connection in larger universes of function. However this viewpoint is obtained, it can be very freeing because you are suddenly working with little more than the effect of light itself. You arrive at a place where a photographic image needn’t be about anything, where you’re working in simple absolutes of shape and composition. At the same time, you’re also conferring that freedom on your viewers, since they are also released from the prison of literalism. They can admire, even love, a pure composition for no relatable reason, just as we all did with our old stencil kits and Spirographs. This all takes us full circle to our earliest days, and one of the first experiences any of us had as designers. Remember being told to fold a piece of construction paper in half, then half again, then half again? Recall being invited to randomly cut away chunks from the perimeter of that square, any way we wanted? Remember the wonder of unfolding it to see our cuts mirrored, doubled, cubed into a stunning design? Remember what the teacher said when we unveiled our masterpieces? Oh, look, class, she said, you’ve made a snowflake.